Police spend astronomical amounts of time and cash repositioning themselves as therapists but still reveal their base nature of State-endorsed thuggery. In a break from tweeting about thought crimes and advising us to be nice to one another, police are ramming suspects from their mopeds. 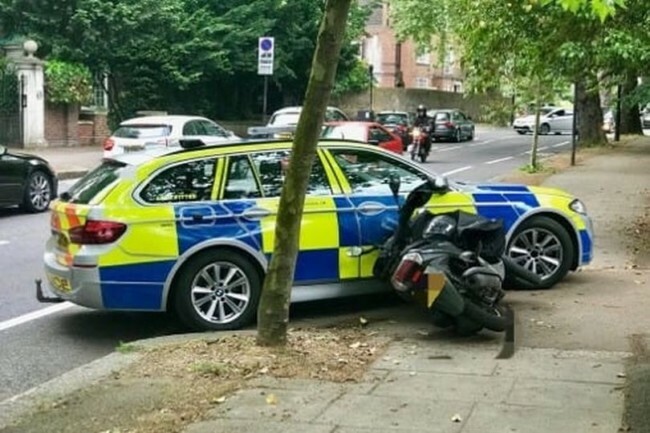 Police officers are allowed to use their vehicles to knock moped thieves off their bikes. The mopeds don’t ned to be stationary, sat outside the jewellers or kebab shop, but can be travelling at high-speed. It matters not if the perp is wearing a helmet or is a child. It’s less a case of what can go wrong then what can’t go wrong. Tim Rogers of the Police Federation of England and Wales reminds serving coppers that it is “dangerous to drive a car deliberately at another road user. The law clearly classifies this as dangerous driving, and officers could be prosecuted. No defence, no exemption.” Good. But the police are all about telling not listening. So they just tug the helmets one their ears and press a foot to the floor. The Metropolitan Police points at the stains on the tarmac and says there had been a 36% reduction in thefts involving mopeds since the tactics were adopted. West Midlands Police tweets: “Some brave decisions being made regarding bike crime and the pursuit of offenders using bikes. Something I strongly suspect the public support?” The only thing braver than ramming someone on a bike are strangling guinea pigs and taking two bottles into the shower. In tomorrow’s news: Brave police cut down on squatting by torching buildings! Courageous police push Tube fare dodgers in front of trains!